Spencers Solicitors | What's being done to deal with uninsured drivers? What's being done to deal with uninsured drivers? To tie in with the new 63-plate cars being released this autumn, motorists are being warned to check their insurance documents. 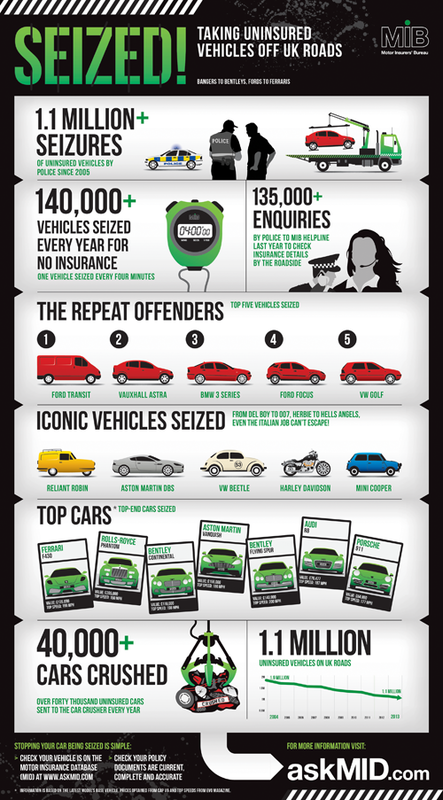 The Motor Insurers' Bureau (MIB) have confirmed that last year more than 600 brand new cars were seized for having no insurance and more than 140,000 vehicles are seized by police every year for being uninsured. The police were first given the power to seize uninsured vehicles in 2005 and since then more than one million vehicles have been taken off the road. Records show the type of vehicle to be most seized over the last three years is the Ford Transit, but some of the more unusual vehicles seized range from tractors and horse boxes to a Rolls Royce and even a Lamborghini! As a result the police are strongly warning everyone that no matter who you are or what you drive, if you are uninsured you will be taken off the road. But it is not just those that blatantly flout the law that fall foul of the police's right to seize vehicles; there are a lot of genuine policyholders that unwittingly fall into the category of being uninsured because they are simply using the vehicle in way that is not covered by their policy. What if you are involved in an accident with an uninsured driver? The MIB estimates that there are currently 1.1 million uninsured drivers on our road and that this costs every insured motorist around £30 per year on their policies. In the UK around 26,500 people are injured and 130 killed every year by uninsured or untraced drivers. Primarily the MIB manage a fund made up of contributions from every UK motor insurer. From this fund the MIB can allocate compensation to victims of uninsured or untraced drivers. However before awarding compensation the MIB require the claiming party comply with their own conditions set out within various agreements which can be very complex. There is one agreement covering claims made against uninsured drivers and another for claims against untraced (hit and run) drivers. Innocent drivers can feel like they are being made to jump through several hoops before the MIB will decide if they are entitled to compensation. The whole process can be complicated, time consuming and frustrating even for those of us who have used the system for many years. One of the first problems a claimant will face is proving that the incident has been reported to the police. If this is not done the MIB have a get out clause which states that they do not have to pay any claims that are not reported to the police within days. It is therefore essential that you report the incident to the police immediately. I would always advise anyone who has been involved in an accident with an untraced or uninsured driver to obtain specialist legal assistant. As complying with the relevant MIB agreements, tracing potential insurance policies and making the necessary applications aren't straightforward tasks. The MIB agreements which were first introduced way back in 1946, have for many years remained unchanged and have never sat comfortably with our own, or even European law. Over the last few years the MIB has set out to update all their agreements so that the conditions for making a claim are more compatible with UK law. This is good news and bodes well for future claims, as the MIB are also looking to make the agreements easier to understand and to streamline the whole claim process. But for many years the MIB have restricted claimant's rights to make an injury claim to just 3 years regardless of whether a child was involved and only 9 months if the claim was for only property damage and associated losses. However I'm please to inform that the MIB have now amended their conditions under the Untraced Agreement so that the limitation period mirrors that of UK law. This means that for any person involved in an accident with an untraced driver on or after 1st May 2013 has the normal 6 years in which to submit the claim for property damage (not including injury). As with any claim, however, it is essential that you pursue it as quickly as possible so that any essential evidence can be obtained and relevant investigations made whilst the information is readily available and relatively easy to obtain. The MIB have also launched an online application system which allows lawyers to submit claims immediately to the MIB, significantly improving the time to process compensation claims. So while the UK's uninsured driver problem doesn't seem to be going away anytime soon, it's reassuring to know the police and MIB are continuing to take steps to get them off the road and not leave insured drivers without the right to claim compensation.